my daughter lives about a mile from the Savannah River. The subdivision is located in a wooded area. she loves feeding birds, rabbits, and an occstional deer. this Spring she was delighted to find a doe had delivered a fawn under her deck. they used the shelter of the deck for about a week and then they were off. The only down side is they enjoyed the foundation plantings. but they said it was worth it. Our first born has a 24 acres homestead and six bourses, a mule, and a miniature horse and a cart to fit. Their grandchildren have a week end riding fun. We left our six acres to move into a life community that has wonderful” landscaping. I appreciated your article and I have been watching the “environmental movement” for 40+ years. I look at the movement on several levels. I believe the environment needs to be viewed on a macro and micro level. Most things, I believe, on the Macro level are out our control. Many things on the Micro level can be improved and influenced by humankind. I do believe we have an earthly mandate to reasonably care for our environment. Much the same as “even though we are going to die” none the less we do all we can to reasonably protect our bodies. The dimensions we encounter apart from common sense are often are tainted by both political and religious/spiritual special interest. I wrote the following article 20 yrs. ago as a theology student. 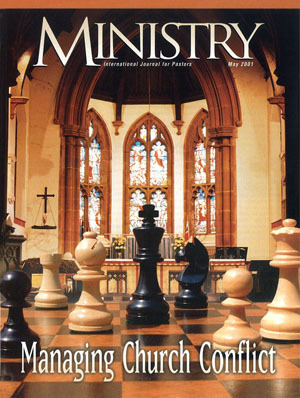 It was published by Ministry in 2001. It may not have all the answers but I think it ask important questions and offers biblical insights. The divine source of earth's environment and our involvement in it. We seldom see see an Adventist quote a translation of the fourth commandment that doesn’t say that that the seventh day is “THE sabbath”. When we identify ourselves as the commandment keepers in Rev 14:12 because we keep “THE” sabbath, we’re relying on a distinction that’s not in the original Hebrew. Thank-you for your thoughtful article. "It is not my perception that anti-environmental messages are commonly preached from Adventist pulpits. I do not believe our clergy wants, or dares, to encourage their audiences to be careless about nature and the environment." Because the Adventism does not promote pro-environmental messages…it is promoting an attitude of indifference. Where does this come from? Primarily an over-emphasis on the “imminent” and “soon-coming” of Christ. SDA’s feel and teach that this world is very transitory and never purposely the “now” unless it is to “save souls”. Yes, “radical disunity”. You touched upon a very important concept when you wrote, “is Jesus suffering when nature is suffering?”. How is it possible that the Creator would not be effected by what He/She created? There is much more that we don’t understand about how God thinks and feels about the destruction of this Earth. Adam and Eve were tasked with caring for the Garden and I believe that we have the same responsibility as well. In the end was the church and apostles asked to save the planet or save mankind. When I reflect back to biblical times and nothing has changed just look at out skirts of Israel . Every rock was dug up for gold and resources extracted . Should I go to CESAR and say this is bad or that is bad .We should understand everything is a gift from GOD. Also in light of the sad new off the french cathedral and did listen to some statistics . 52 acres off hardwood took to build it, now this amount is not available these days and we can look back at Solomon’s temple and cedars used. I have Persian friends that jokingly say we have a cedar tree on the flag but there all gone . And the house which king Solomon built for the LORD, the length thereof was threescore cubits, and the breadth thereof twenty cubits , and the height thereof thirty cubits. Thanks Linnea, for a fasinating interpretive focus and a great article. This gives meaning to reading ancient biblical texts and make them convey their messages as a ‘living word’. Traditionally, biblical interpretation strives to rescue and preserve some essential core of (canonical) meaning, and ‘Truth’. As if reading a biblical text, primarily, presupposes a form of literary archeological excavation, aimed at rescuing some authorial intent, or essence. A form of textual psychoanalysis. Your reading open up the space for a recontextualizing of the text to a world that is way different from the environment of its creation. To mee, that makes the Bible revelatory in a new sense. The sign of a true classic.